What? An analogy too far? And I thought I had gone over the top by buying a commemorative tea cup. This week Kat, from Three Bedroom Bungalow joins Toni for a chat about customer service calls. Kat is an American living in England. When my family first moved to the UK I was in charge of setting up all the accounts for the new house. This included of course the phone, the water, the TV, the TV tax, the electricity and the list goes on. I however was not bothered by the fact that I had to set up all these accounts because I was having entirely too much fun listening to the messages that these companies had on their phone lines while I was waiting to speak to a real life human being. There was the bog standard bad muzak being played, however, occasionally a voice would break in and remind you that your satisfaction was very important. In fact, your satisfaction is so important that the voice would then start to profusely apologise for any inconvenience that you may experience while holding for a representative. Wait, what? Do people not expect to hold for a representative here in UK? Am I supposed to be connected right away all the time? What foreign concept is this? I actually found it so funny at first that while I was doodling on the piece of paper in front of me that I wrote down the entire hold message to read out to my husband when he got home from work. It was that funny. Of course I later learned that, no, I am not going to get through automatically to a representative. British telephone customer service just dictates that they must apologise no matter what. Even if they have done nothing wrong. I could be calling to tell the company that they have the best service ever, but if I wait more than a tick, I had better be appologised to! Now I just wish that the utility companies who have the best hold messages ever would train the shop assistants that barely acknowledge my existence. The thing that always makes me laugh about customer service calls in the States is the voice prompt call. When my kids know I’m on one of these calls, they gather round to watch the show. Then I’m on hold, which is interrupted every thirty seconds by a soothing female voice telling me my call is very important to her but why don’t I sod off to the web site and stop wasting everyone’s time. Well not quite, but it’s very obvious that Internet is their preferred method of communication. Tough if you’re phoning about a computer or web site problem isn’t it? When my call is finally answered the introduction is so long I forget why I’m calling. Last week I wanted to find out where I could by my vacuum bags, which seem to have been discontinued (just the bags, mind you). After being re-routed to Uranus and back, the nice man wouldn’t answer my question until I’d set up an account. “Why do I need to set up an account to ask you a questions?”, I pleaded. “So that we have all your details if you call again”, was the nonsensical reply. “Never mind, I’ll just do a web search”. It’s enough to drive you to the web site. We must pay tribute to the late, great Elizabeth Taylor who died today of congestive heart failure. Liz was born in Hamsptead, London to American parents and held British and American citizenship. Not only was she a legendary beauty and one of the greats of Hollywood, Liz was a passionate advocate for AIDS research. An article in FT Magazine - – got us thinking about how we greet one another—a handshake or bear hug. There are still many things that amuse me about the USA even after 20 years here. 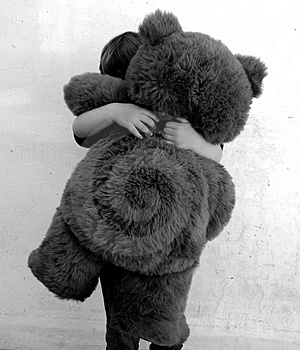 One of them is the bear hug. Here in the mid-west you don’t gently kiss people on the cheek when you greet them, or shake hands if it’s guy-on-guy, you give them a big old bear hug. Sometimes there’s an accompanying kiss on the cheek as the hugger moves in for the full body envelopment, but often it’s just a hug. If a woman wants to show that she really likes a person (in a platonic way) she’ll stop about ten feet away, raise both hands straight out in front at shoulder height, perhaps waggle her hands a little, and run in little steps to the target. Sometimes there’s a high pitched squeal or a drawn out “How are you?” Then both arms are flung around the other person’s neck. This happens every day at the school gate and these women see each other almost every day. While people don’t hug you when they’re first introduced to you, they could well be hugging you by the end of that encounter. For example, if I was introduced to someone at a dinner party I’d shake their hand. By the end of the dinner however, particularly if we’d clicked, there would be a hug. It might not be as tight as a hug from a good friend, but a hug would still be in order. The Brits that I know here all do it too, but only to Americans. When we Brits meet and greet each other, we revert back to leaning in and pecking once or twice on the cheeks. Minimal contact. And it’s quite a relief sometimes too! My wife is the recipient of many a bear hug when we visit the States, even from people she just met. Due to her being my wife, if a good friend of mine meets her, she is instantly awarded “good friend by proxy” status and given The Hug. It’s not an issue or anything, just a cultural difference. What I get, in addition to bear hugs from the ladies, is the manly ritual firm handshake with the left arm extended in a sort of half hug, ending with a pat on the back. It’s second nature to me. Living in Britain and having those experiences when we visit the States made it surprising that the article linked above classified Americans as repressed. I guess, in comparison to the rest of the world, they are. I just happened to land in the only country on earth that makes Americans appear unabashedly uninhibited by comparison. Over here it is a handshake and a kiss on the cheek (actually, it’s a kiss in the air next to their cheek, unless they are a good friend). I find this a bit tame. This discussion, however, is limited to greetings and the article expands into other areas where, I would have to agree, the Americans come across as quite prudish, even compared to the Brits. But other cultures leave us both far behind: in Finland, for instance, you might strip naked at a dinner party and hop in the sauna together. So there are varying degrees of what we, as a culture, are comfortable with. I think, for me anyway, the happy medium lies somewhere between a polite handshake and getting naked in the sauna. A nice, firm bear hug perhaps. 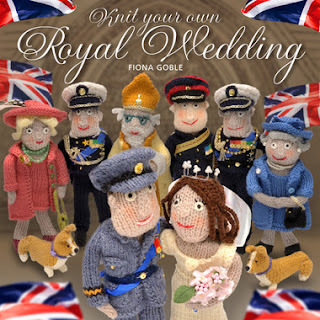 MidWeek Mention - Knit Your Own Royal Wedding! Get yer knitting needles out and Knit Your Own Royal Wedding with author and knitter Fiona Goble. 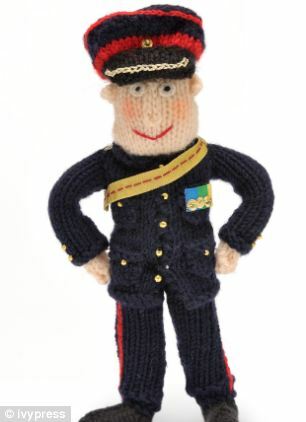 Figures include the Royal family members, the Archibishop of Canterbury and the corgis, which are apparently the most difficult to knit because their legs are so small. Each character takes about five hours to knit and it's not really something that beginners should tackle because the patterns are intricate. Is America too Sweet or Britain too Bland? On a recent visit to the States, Mike noticed that his taste buds had "evolved". I was surprised, on our recent visit, at how sweet America was: the beer, the bread, the pretzels (sugar-coated pretzels—honest to God) and even, oddly enough, the candy. And if it wasn’t infused with sugar, it was too salty and/or covered in cinnamon. After nearly ten years in UK, I found it all a bit too cloying. During our stay, we bought a box of Whoppers, the US version of Malteasers (or, if you prefer, Malteasers are the UK version of Whoppers) and after eating three I felt, literally, nauseous. The coating was some sort of concoction found only in a laboratory and the center was compact and shockingly sweet. We found it difficult to order coffee from Dunkin Donuts because they routinely put one or two measures of sugar in a cup. “Regular” means cream and sugar; to get a coffee with milk only required conversations and confirmation with several employees and a confusion of clerks trying to figure out coffee without sugar. Conversely, my wife and I had brought over a selection of sweets from an old fashioned sweet shop in our town as gifts for the children we would be seeing. I am afraid the American children found them rather tame; they just weren’t sweet enough, or sour or tart enough. Every US confection, it seems, has to be over the top and in your face. This got me wondering: are Americans unable to appreciate nuance? Or are the Brits just too tame with their taste buds? Are Americans missing out on the delicate blending of subtle flavors or are the Brits eschewing a marvellous taste sensation? For my part, I favor subtly. I realize that, while I was there, I enthusiastically sprinkled sugar, salt and/or cinnamon on everything I ate (and I suspect this practice has become worse during my absence) but now that my body has detoxified, it can’t handle the copious amounts of condiments any longer. Bland? Have you tasted Marmite lately? While I do agree that American food has some strange stuff added to it, I wouldn’t call British food particularly bland. Rather than sweet, there is often a surprisingly savoury taste when you least expect it. 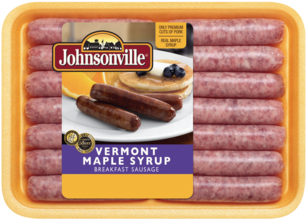 While Cumberland sausage can have a peppery bite to it, Americans actually build their sweetness into the sausage, with maple syrup mixed right in. And then there are salads. A typical British salad is Coronation Chicken, with its strong curry flavour, whereas the American salads I was first presented with (in the South) mainly consisted of fruit and frothy bits. You’d be forgiven for assuming such sweet salads were in fact, dessert, except that they are often served with BBQ. Open and drain all canned fruit. 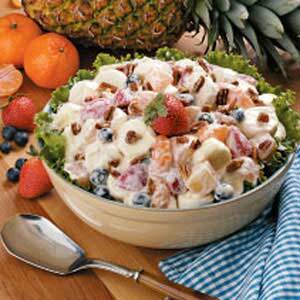 If also using fresh fruit, chop and set aside in a bowl. Soften cream cheese in a large bowl. Mix Cool Whip and dry Jell-O (just the powder) with the cream cheese. Make sure that all of the sugar/powder from the Jell-O is dissolved. Finally, add the marshmallows and canned/fresh fruit. This isn't a sponsored review, sadly. The Black Death - How this terrible disease shaped medieval society. What Ailed Henry? - According to new research, Henry VIII might have been positive for the Kell blood group, whereby children in utero have a high chance of being attacked by the mother's antibodies. 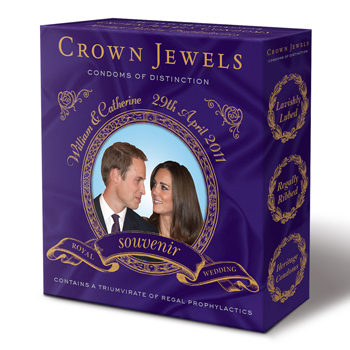 This would explain the large number of miscarriages and infant deaths his wives experienced. There are tons of book reviews, and a heads up about upcoming TV and Radio programmes of a historical nature. The Out & About section takes you to real places in the UK and tells the stories. 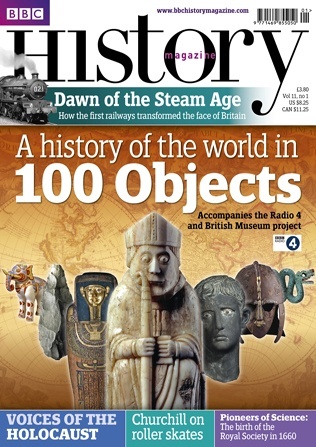 The February issue features 9 places which were of particular note during the Black Death. All this and free podcasts too! There's a special offer at the moment so for less than twenty quid or around $45 for 6 issues it makes a great gift for yourself or someone else. 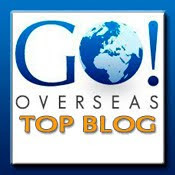 This week, we ponder what “going home” means when you’ve been away for a while. 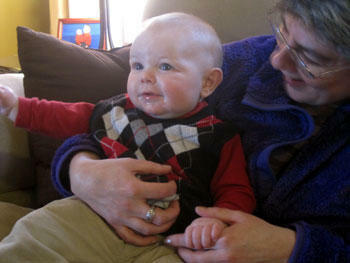 Home, as Garrison Keillor has noted, is that place where, when you show up, they have to take you in. I just returned from a two-week sojourn in my native land and, while everyone was very welcoming and accommodating, it was very obviously not where I belonged. If I had never moved away, it would simply be the place I lived and I’m sure I would go through my days without the sense of underlying melancholic nostalgia that seems to increase with each visit. By being away, events in my past life take on a significance they never would have had otherwise: the house—many times sold and modified since I last was inside it—where I visited Mary Callen one night while she was babysitting and had to climb out the bathroom window when the parents returned unexpectedly early, the curve in the road where four of my friends died in a spectacular car crash, the bend in the creek where I spent many lazy and languid afternoons. These tattered remnants of time haunt my visits now and make me wonder if I could ever move back and truly fit in. And other ghosts appear, as well. My son is no longer the child, but a father, promoting me to grandfather, and I see myself in him in surprising ways. My own father, the white-haired patriarch of the family, will someday pass that title to me, white hair and all, and the new child (as well as his future siblings) will now be the focus of attention, concern and hopes for the future. It’s as if we have all been promoted to the next level on the conveyor belt to eternity. I had a wonderful time there, really, but I almost relieved to be back in Sussex. I am certain there are many, many ghosts here but, so far, none of them are haunting me. I still dream about “going home” but I know it will be a bit of an Alice in Wonderland experience if I ever do. Half of the names I read about these days have no meaning for me at all. A quick glance at the Mail Online (for blogging purposes only) usually leaves me non-plussed. Katie Price? Didn’t she used to look different? Wasn’t she called something else? I’ve never heard of half the boy bands and couldn’t pick out Peaches Geldoff in a line-up if my life depended on it. It’s a bit of a weird feeling when I do “go home”. A lot has changed and yet a lot has stayed exactly the same, and I’m not just talking about Ken and Deidre in Corrie. I always feel right at home as soon as I step off the plane at Heathrow, and yet I don’t always know what I’m doing. 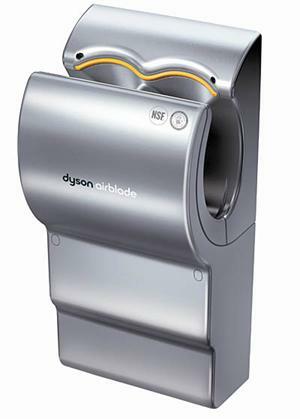 Before they made their debut Stateside, those bloody Dyson hand dryers used to scare the life out of me. You could do yourself an injury with one of those! And I was completely wowed with the hand held gadgets that are commonplace in UK restaurants now, but still a bit of a rarity in the USA. It’s bliss to sit on a loo without worrying that everyone on the other side of the door can see you, but not so great when the service beyond the public loo is so slow that I sound like an American when I voice my impatience. Perhaps there’s a no man’s land somewhere in the middle of the Atlantic we could all stop off at to re-adjust before heading “home”? This is sharing rather than just mentioning, but is hilarious nonetheless.